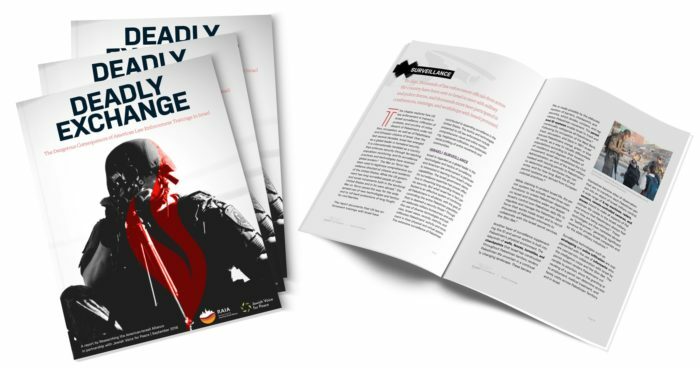 While Tatour has gained international support, Israeli authorities are attempting to constrain her ability to defend herself at her upcoming hearing on Tuesday September 6th. In a troubling development, the prosecution asked the judge not to allow Tatour’s defense team to submit their own translation from Arabic to Hebrew of Tatour’s poem that is at the center of the case, “Resist, My People, Resist Them.” Tatour is expected to testify at the September 6th hearing to explain that her poem, which was mistranslated by an Israeli policeman, is in fact a legitimate protest against crimes committed by Israeli settlers and soldiers occupying Palestinian land. 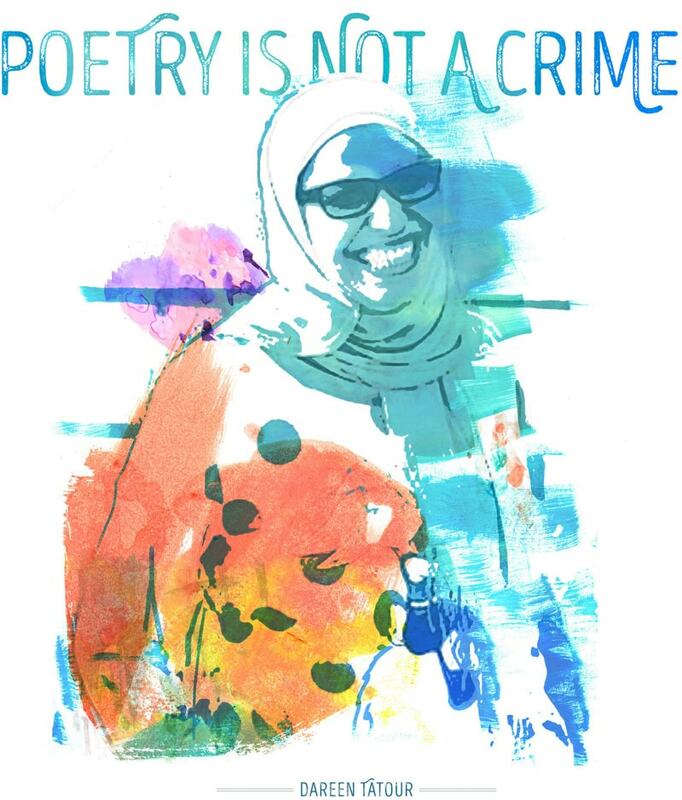 Dareen Tatour faces up to 8 years in Israeli prison on the charge of incitement to violence for her poem posted to YouTube and for two Facebook postings. Tatour was first arrested in October 2015. She was imprisoned for three months before being released to house arrest in an apartment rented by her family for that purpose in Tel Aviv. In late July, as her plight was gaining more international attention, she succeeded in challenging the conditions of her detention. A judge granted her appeal to move her house arrest to her parents’ house in her hometown of Reineh. In a newly translated poem written from prison in November 2015, Tatour explained, “A poem stands accused, my poem morphs into a crime. 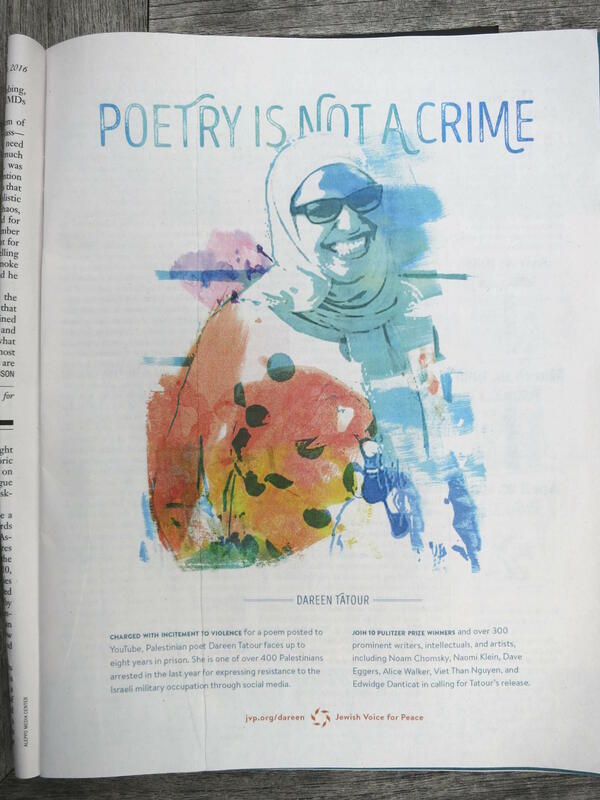 In the land of freedom, the artist’s fate is prison.” In a podcast interview published by Warscapes Magazine on August 31, Palestinian-American poet Naomi Shihab Nye, one of the signers of the letter, discussed Tatour’s case and the powerful force of poetry to express opposition to injustice. Interviews with poet Dareen Tatour can be arranged upon request.